There have been 221 images uploaded to this topic. (View topic image gallery). There are 276 posts in this topic. You are on page 6 of 6. Awesome story and such perseverance! Keep on grinding Pescos!! Welcome to the business! Congratulations @coz! It is smart to start small and grow slowly. I'll let you in on a little secret. 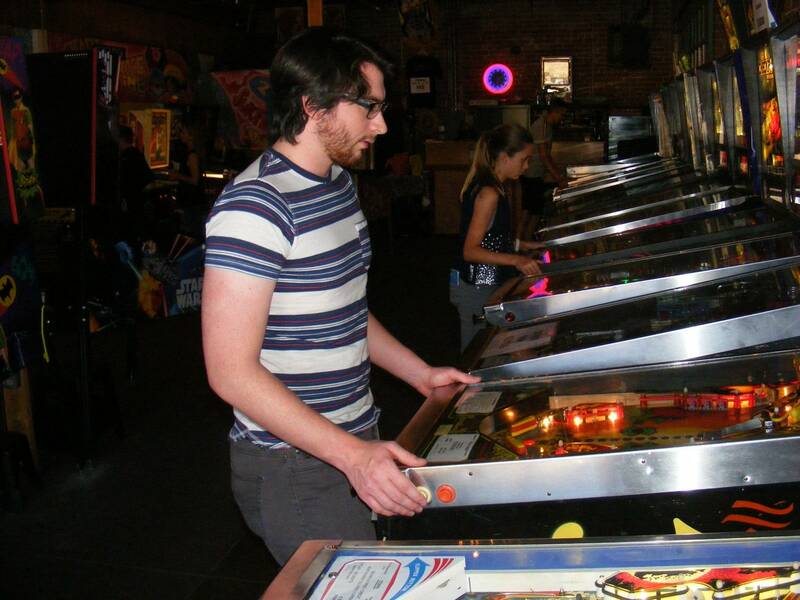 When I decided to begin my business as a pinball operator, one of the key deciding factors was that I was going to share my experience on Pinside so others would one day consider the same. That was the plan, but after all of the not so great experiences, I wonder if this thread will, instead, discourage some from becoming a pinball operator. I'm glad that you have decided to take the plunge, even after reading about all of my ups and downs at Pecos Pinball. I will say this. Yesterday a gave a free game of #mr-and-mrs-pac-man to a young man at Hot Rods. 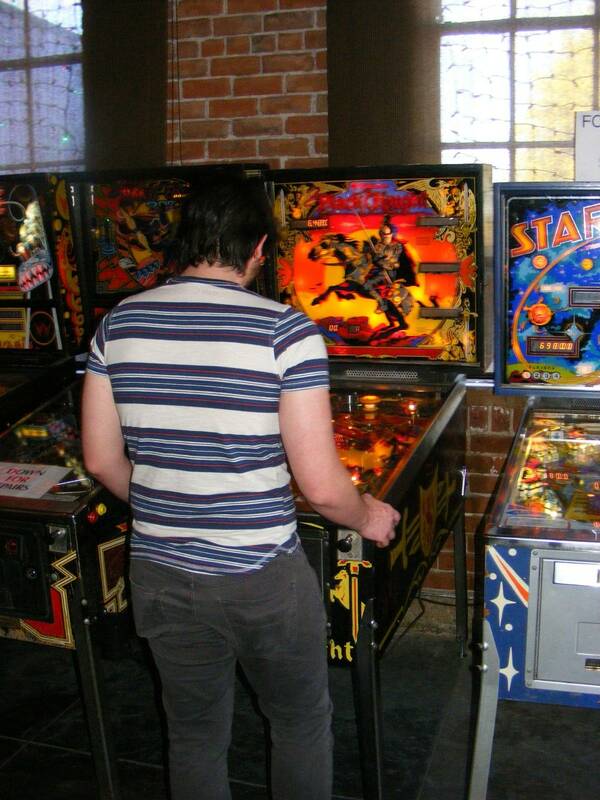 He had never played pinball before. He came running back and skipping up a storm to mom and dad to get more quarters. He told me that he loved the game. THAT and all of the smiles I see make all of the hard work worth it! Had a good time tonight at Hot Rods. The machines play great - very well restored. I had a wonderful time chatting with you and your wife. It was a real pleasure meeting her.. She was a sport to have to listen to us talk pinball all evening! But it was Baxter who was the highlight of the evening. He is so cute! He brought his John Deere tractor along, green, of course and not full size. He is only one and a half years old but kept saying 'ball' and pointing to the pinball machines! After a nice meal we went out to play some pinball. He chose #mr-and-mrs-pac-man. We pulled up a chair for him to stand on. Mom and dad took turns helping him play. What a pleasure to have such a young pinball enthusiast play one of my games! You have raised him right. I enjoy checking in on you adventure as pinball operator. 1 If it was easy more people would still be doing it to start. Do i think the battles you have had scare off some I guess it's possible. But your not sugar coating it so others that do decide to go this route understand it's not just buy some games dump at some place and presto your making money. Doing what you are is using skill,time,talent and understanding the business something some current operators need to learn quick. I wish you luck in this and spreading pinball to more people. When you get it right then we (pinside) get to buy your future book Pecos Pinball successful formula to vending pinball. Walk into Hotrods Old Vail and what do you see? Three classic Ballys all in a row! Three!! Bring your quarters and bring your friends! The fun you find here never seemingly ends! Eight actually, but who's counting? Someone tried to break into Super-Flite last night at Hotrods. I had five heavy duty locks I had gotten from my San Tan Valley Project Pin guy on five of my pins and a cheap lock I got on the Internet on Super-Flite. Guess which one they broke into? I could pull the door open. The thief didn't even have the common courtesy to put the lock back in the 'closed' position. They didn't get anything. The coin box has a lid and a padlock on it. My concerns about quality locks is justified. I replaced the lock with a lock intended for the back door as a temporary fix. I will be putting a heavy duty lock on soon. Have you posted any earnings (per machine) from your games on route yet? from your expenses (initial investments) in getting this operation going. I was lucky to pull in about $50 a month. Finding the right location is key for sure. when I moved to Scotland for a couple years. WTH....was this after hours? Did they break into the establishment as well ? I lost approximately $1500 in 2018. And that doesn't even include the gas, wear and tear on my truck and the cost of my time. The cost of gas and mileage are not trivial. I drove 1,500 miles last year in travel related to my business. No break-ins except for the pin. I still don't know what happened, but no money was lost. It is not unusual for a business to lose money their first year. I drug my feet getting clients and that hurt the earnings. I expect to break even or even make a profit in 2019. The new license tags are on all of the games, and for the moment, all are working. Got a The Six Million Dollar Man from my San Tan Valley Project Pin Guy. It has cleaned up nicely and is now working 100% less a solenoid that is needed for the right sling shot. I made some custom drop target decals for it. After reflowing the solder on the displays, all seven are working, which is a relief. Working original displays are getting harder to come by. It is fast! Super fast and fun! I also have Aztec 1 almost ready to go. I spent hours trying to get the PITA mini-match unit working - finally decided to filch one off of Aztec 3. Working pinball inventory is a problem. I only have four games ready to go on location. It's been the usual small problems getting the six pins at Hotrods Old Vail working 100%. Firepower at D&D Pinball lost it's sound. It turned out to be the bridge rectifier and is now working again. San Tan Valley Project Pin Guy: Provided the heavy duty locks I am using on the coin doors. Sold Super-Flite 1, Harlem Globetrotters On Tour , and The Six Million Dollar Man all of which are or soon will be routed. atari_daze for the station 3 plastic which looks awesome on Hardbody. grnrzr for the displays that made Harlem Globetrotters On Tour look so nice. 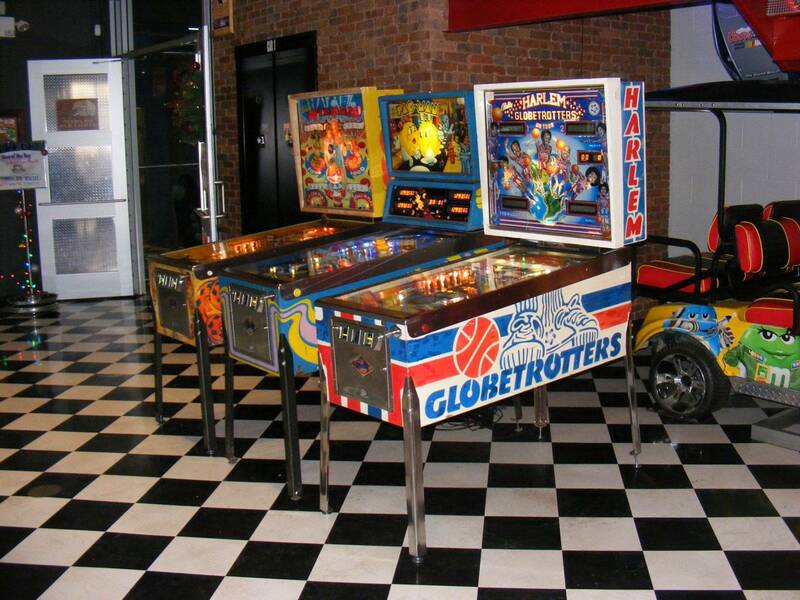 kbliznick at Firebird Pinball for the MPU for Harlem Globetrotters On Tour. forceflow for the backdoor locks that I am using on all of my games. borygard and barakandl for their NVRAMs - no messing with batteries, ever! vid1900 and cfh for their wonderful pin repair guides. I wouldn't be repairing boards without their help. All of the Pinsiders who have answered tech questions over the years. Their answers are still being helpful after all of these years. My clients, Hotel McCoy, D&D Pinball and Hotrods Old Vail. Robert and Constance at D&D for helping out when things were at their lowest. David, the video arcade guy here in Tucson, for selling Travel Time and Aztec to me. Marty, in Phoenix, for the nice job he did on touching-up the playfield on Super-Flite 1. Marty, in Benson, for selling Wizard! 1 to me. Marty, in Sahuarita, for selling Wizard! 2 to me. Yes, that is right. 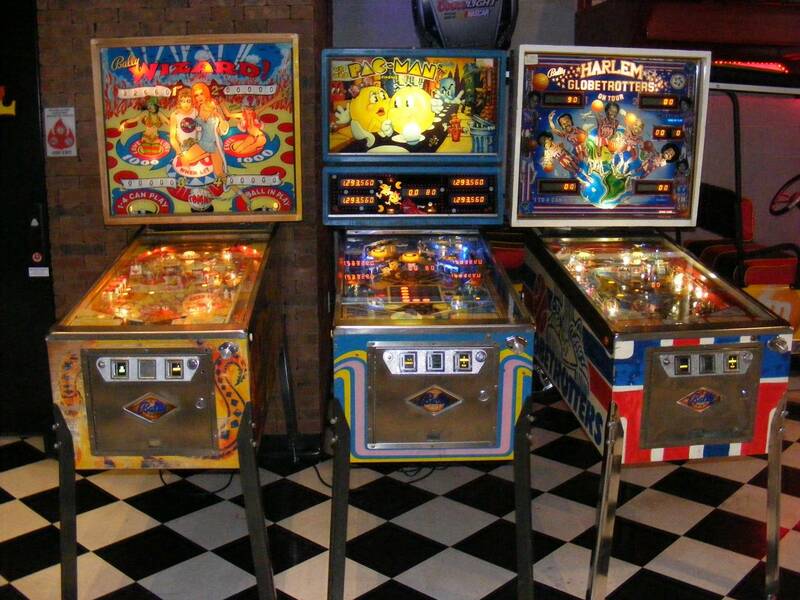 Three different pinball people named Marty and two who sold a Wizard! to me. If that's not freaky, I don't know what is! Dave, my best friend, who helps me move pins when I need the help. Finally, thanks to all the people who play my game and support Pecos Pinball. Without them, there would be no Pecos Pinball! I am sure that I have missed someone. My apologies. The point is that it takes a lot of help to put working games on location and I couldn't have done it without your help! THANK YOU! Great, honest, post, Pecos. Love your positive attitude! Just wish I could give your games a spin. You know I'll make it a point when I'm next in Tucson. Until then, I wish you health and prosperity in the new year! Hey pecos. Wanted you to know I really enjoyed this thread. I've played pinball for 30 years, but it has pretty much been me and a couple of buddies. 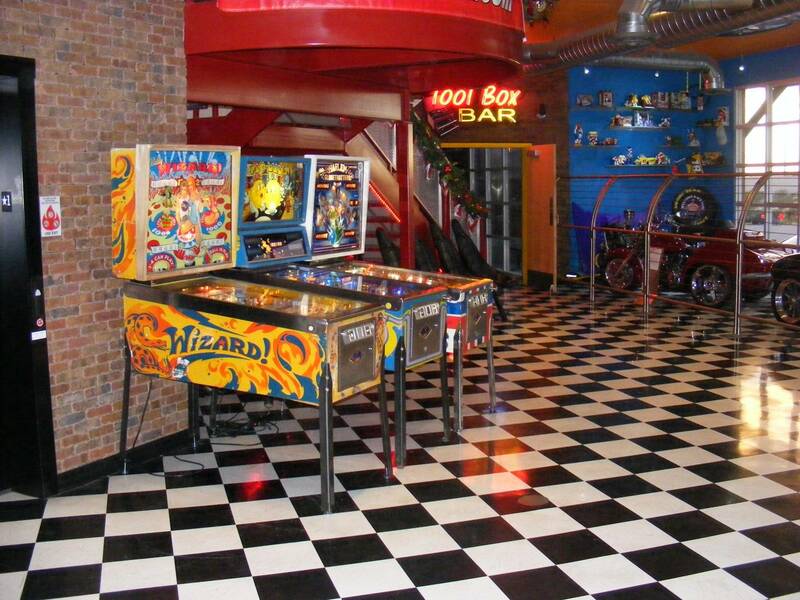 I've had a Funhouse at home for 18 years and pretty much have been living in my own pinball world. Recently discovered pinside and found there is a whole community out there that I had no idea about. Found this thread by accident. It was fun to see the passion for pinball in Tucson. BTW, I also lived in Apache dorm (85-86) and my first real pin I played was Cyclone over at the Bayhorse on Grant Ave. Been hooked ever since. It was weird reading this because I just played your pin over at D&D yesterday! Also desertt1 I've dropped a few quarters into Whirlwind, Taxi, and Diner over the last month. I just may have to show up to one of your tournament nights one of these days! Thanks guys. It was a fun read. Hope to run into you one of these days. Hey pecos. Wanted you to know I really enjoyed this thread. I've played pinball for 30 years, but it has pretty much been me and a couple of buddies. 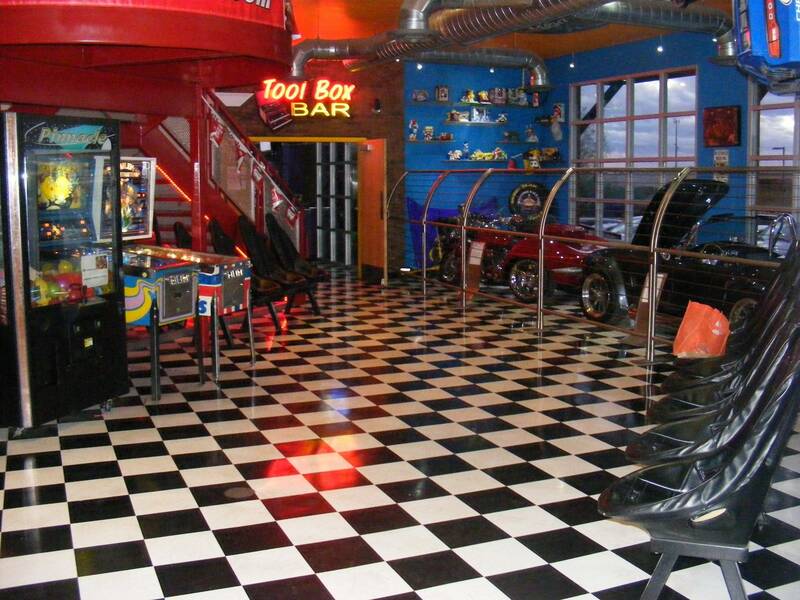 I've had a Funhouse at home for 18 years and pretty much have been living in my own pinball world. Recently discovered pinside and found there is a whole community out there that I had no idea about. Found this thread by accident. It was fun to see the passion for pinball in Tucson. BTW, I also lived in Apache dorm (85-86) and my first real pin I played was Cyclone over at the Bayhorse on Grant Ave. Been hooked ever since. It was weird reading this because I just played your pin over at D&amp;D yesterday! Also desertt1 I've dropped a few quarters into Whirlwind, Taxi, and Diner over the last month. I just may have to show up to one of your tournament nights one of these days! Hey Del, thanks for the support towards all of the local location pinball places. Come check out a tournament when you can. It's a really cool group of players. I'm hoping to get back over to Hotrods this weekend for some games. Hey pecos. Wanted you to know I really enjoyed this thread. It was weird reading this because I just played your pin over at D&D yesterday! Great to hear! I have three games there. I sold Fan-Tas-Tic and Spanish Eyes to D&D Pinball and still own Firepower. Hey Del, thanks for the support towards all of the local location pinball places. I second that motion. Without customers, there would be no games on route. I hope to have more games out later this year. More games on route means more pinball lovers and more interest. desertt1, I would like to make it over to play your games at Blackrock Brewers sometime soon. Why don't we all meet up at Hotrods Old Vail for lunch some weekend? The pinball is on me. I would like to meet you and talk some pinball! We might even be able to get upstairs and play Hardbody and Aztec. The invitation is for any Pinsider who can make it. PM me, please, if you are interested. Yeah, it's about time I let a few more Pecos Pinball secrets out of the bag. Some of it is rather mundane, but that is the life of a pinball operator. I hope it doesn't bore you to tears. I think we left off at the end of 2018 so that is where I will pick up the story. 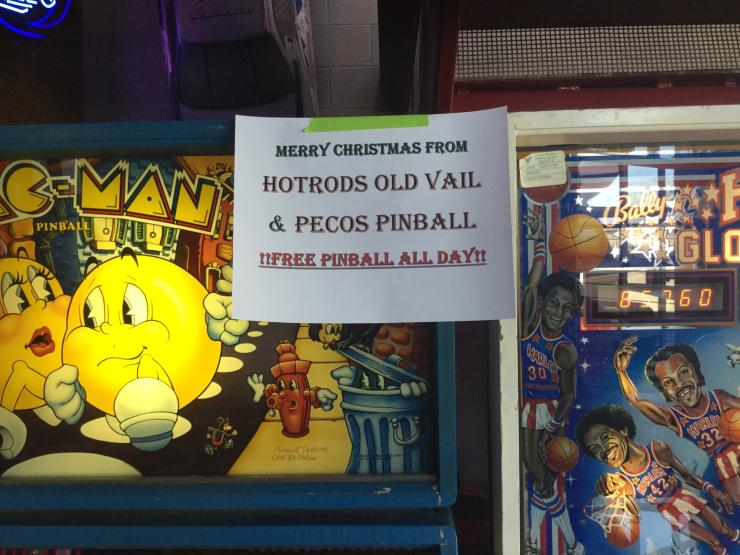 I mentioned in another thread but not here that we had a free pinball day, Hotrods Old Vail and Pecos Pinball's way to give something back, a Christmas gift. The cook and assistant manager helped me move Super-Flite, Aztec and Hardbody down from the second floor to the first so we had a nice six game line-up in the lobby. It was a big success! At least once, all six games were being played. You can read more about it here if you feel so inclined. The managers were kind enough to leave Super-Flite downstairs where it is getting a lot more play. I have been going out there about once a week to fix the typical 'pin on route' issues - broken sling-shot rubber rings, twice on the same Super-Flite sling shot, reflowed all Mr. & Mrs. Pac-Man displays, broken drop target on MMPM, replaced all eight 'ghost' drop targets with new, broken flipper inlane wire guide on MMPM, sluggish spinner on Harlem, broken fliper EOS switch, etc., etc. One of the displays on Harlem Globetrotters is missing a digit, probably a bad resistor, but more ominous is the two digits developing burn marks. I have been looking around for LED displays that I can afford. That's an oxymoron. I can't afford any of them! You can read more about my quest to find the best LED displays here, but only if you want to read more boring stuff! Pinitech's Retro Kits would be best for me but acebathound will only sell them as a five group kit. I will probably order one from Wolffpac Technologies. I would really like to keep these old games with the original displays, but that is no longer possible. The displays are at the end of their life and I will keep the original for home use only. I'll stop now. This is the boring stuff! Horods Old Vail is like the Space Shuttle sitting on launch pad 39A at Kennedy Space Center, poised to explode into space, not literally, mind you. The word is slowly getting out about the excellent food, thanks to the new executive chef, Carlos. Both managers go out of their way to welcome customers and treat them to the best dining experience possible and they support me 100% which makes my job so much easier. Revenue has be increasing steadily month over month. The managers tell me that people are coming just to play pinball. That is great news! 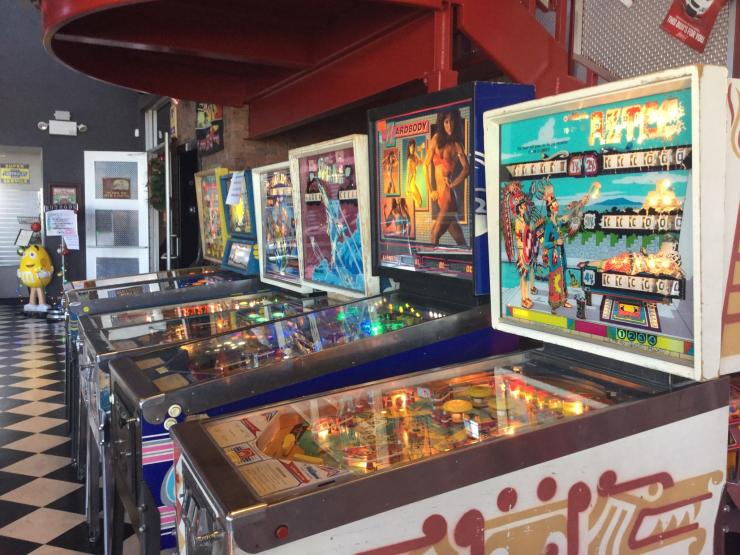 Come for the pinball but stay for the food. The smoked chicken wings, french fries and salads are especially yummy! 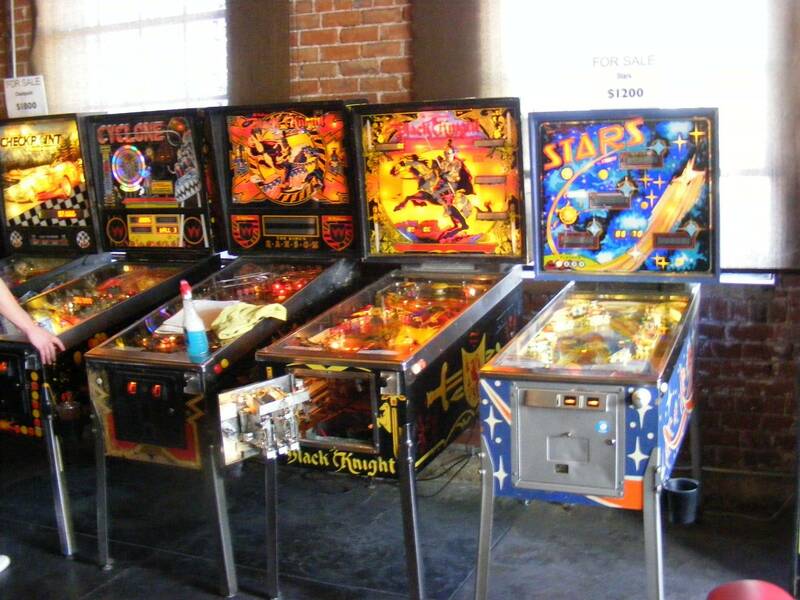 I plan another free pinball event, this time in coordination with a future event they have planned. It hasn't been confirmed yet but will let you know the date and times after I have approval. Firepower at D&D Pinball has been getting a lot of attention. Like my games at Hotrods, the revenues have been going up each month and are becoming 'significant.' Special thanks to Robert and Constance at D&D Pinball for allowing Firepower to be part of their line-up. Firepower has had only a few problems. The left coin mech has been causing me problems. The sound board died - it turned out to be the 2A bridge rectifier. I knew that the sound board had it's own power supply and bridge rectifier but I couldn't find it! I was looking for one of those big square rectifiers and it turned out to be a small rectangular bridge rectifier. I have read that the original rectifiers were undersized. I replaced it with a 4A bridge rectifier and should never have another problem with it. Now, there is a problem with the speech. It works in test but not when the game is playing. I'll stop now. It's getting boring again! Travel Time at Hotel McCoy is doing surprisingly well money-wise and has been very reliable. A couple of weeks ago the time unit was sluggish. It turned out to be a broken coil (solenoid) stop on the time unit stepper. I showed the manager some pics of the Op-Pop-Pop I am restoring and she fell in love with it. You have to understand that Hotel McCoy can best be described as an art boutique hotel. Op-Pop-Pop's theme is 60's psychedelic art. It was manufactured in 1969, a perfect fit for the fully refurbished Hotel McCoy that was built in 1970. And it has Pointy People! Travel Time will probably be coming out and Op-Pop-Pop in. I have been very pleased with the performance of these old pins. The only issues I am seeing are the typical problems of any pinball machine on route. 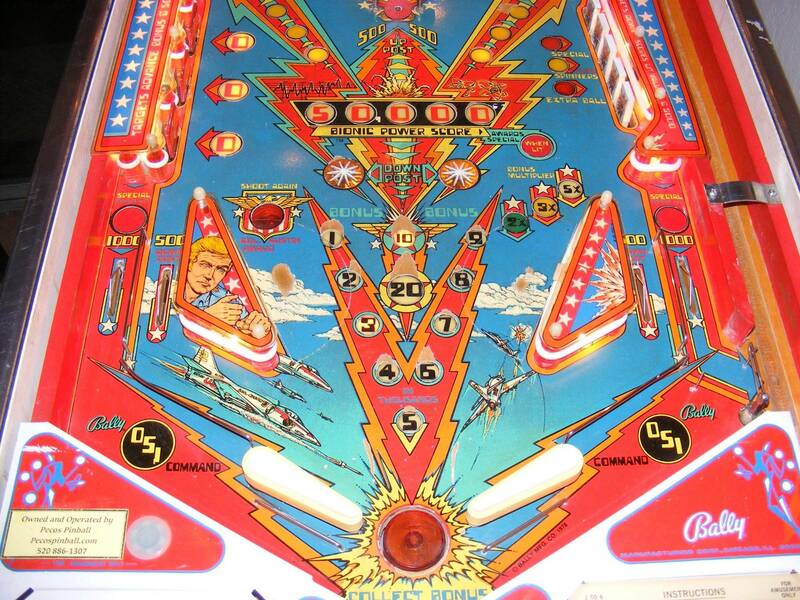 If you want to become a pinball operator, take heed, and make your pins as bullet-proofed as possible before putting them on route. Thanks to vid1900 and cfh, I have reliable machines. Their repair guides have been invaluable to me and I'm not sure I would have pins on route without their help. And finally for now, only because this is all I can remember at this time, I have been a tad concerned about my pins sitting in the lobby at Hotrods Old Vail, only a few feet from the front door. Two guys could pick up a game, move it to their car and speed away in less than two minutes. I have made a small investment in some anti-theft insurance. The chain is just over 12 inches long, is hardened steel and came from Ace Hardware, $4.99/foot. 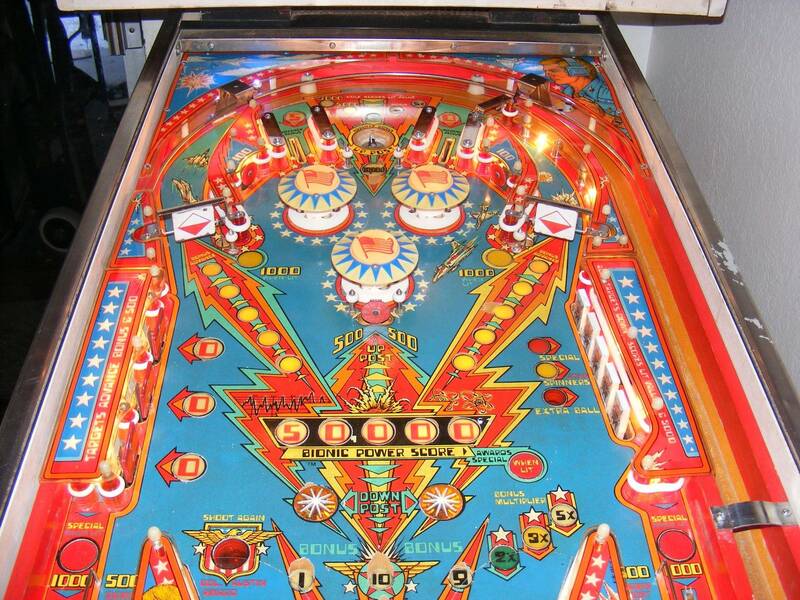 The leg bolts are slightly longer than the original, are called 'extended leg bolts' and can be purchased from Pinball Life, and probably elsewhere. A washer and leg bolt are inserted into the end link of the chain and put into the back leg bolt hole. Importantly, a nut is added to the bolt on the inside of the cabinet. This keeps someone from simply removing the bolt. The same is done for the other end of the chain. It is put on the game next to the first game, tying the two games together. Two thieves can move one pin easily enough, but they can't move two! It's cheap insurance and I sleep better at night. Glad to see an update. Yes some may fuss about the details. But this what most want to be operators/new guys in the business didn't know about. So i see this as is good stuff so keep it up as you have the time and ability. Pinitech's Retro Kits would be best for me but acebathound will only sell them as a five group kit. On that note, send me a PM if interested in a single display for the newer style Pinitech UNO / TRADITIONAL sets. It seems you want to just replace a single display or two in a game and those would be your best bet in terms of an LED display matching a plasma display look. 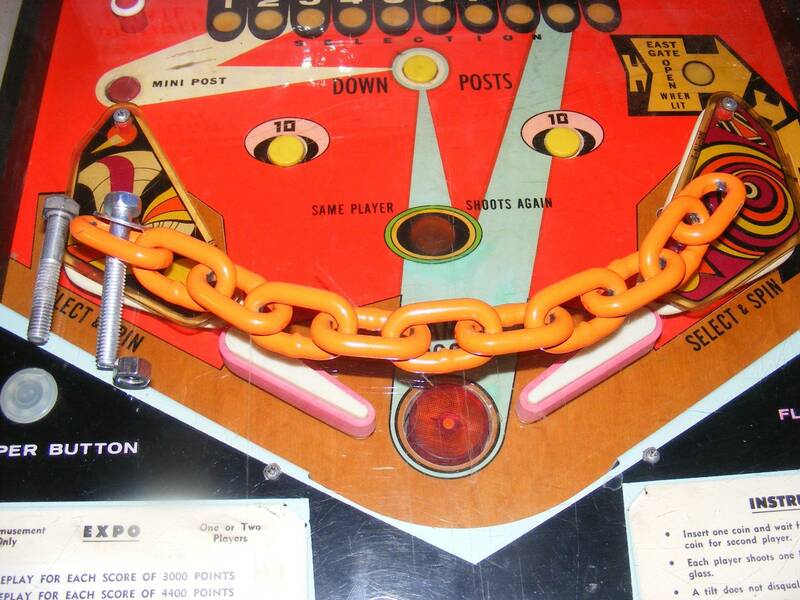 http://www.pinitech.com - "Pinball Inspired Technology"
Looking at your orange chain to deter theft, do you have your pins insured? Good stuff Pecos. I read your thread when you first started it last year and am just revisiting it now. Great to see the progress over the year, congrats. That's good to know cp1610. 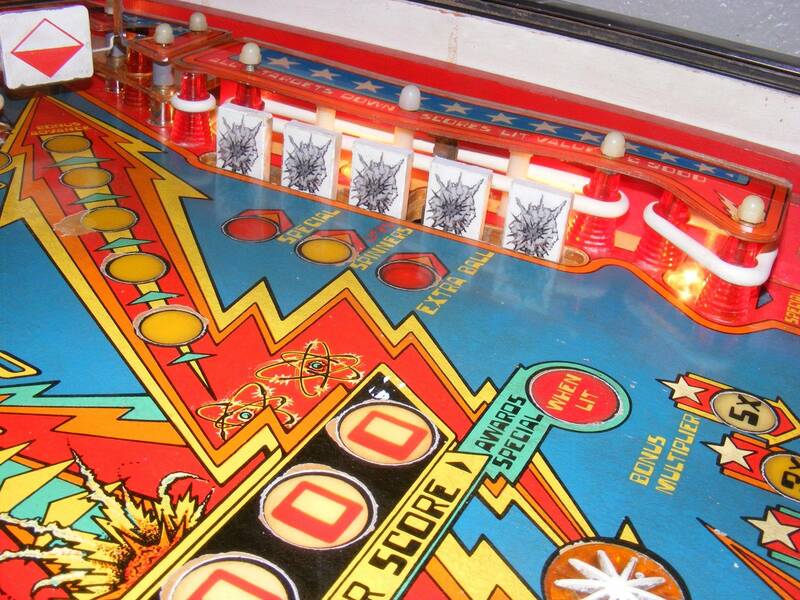 A lot of the pinball operator's work isn't glamorous but it is critical to keep your games playing well. There are a couple issues that I forgot to mention. First, Wizard's left flippy got 'sticky.' I was working on it when Buck, Hotrods manager, noticed a bur at the end of the flipper plunger. The plunger was being 'mushroomed', not typically something you typically see on a game in a home, but something I will be looking for with my pins on route. I scraped off the bur with a pair of scissors, all I had at the time, but will be bringing my angle grinder to remove the mushroomed plunger bits. Buck, you can be on Team Pecos Pinball anytime! Also, I mentioned that I had multiple issues with sling shot rubber rings, but didn't mention what I am trying to do about it. The first thing I check when I work on a machine is look at the flipper rubber rings. They are usually dirty. I remove them, clean them with Isopropyl alcohol and rotate them before putting them back on. The end of the flipper gets the most wear and by rotating the rubber rings, you can make them last longer. I am going to be doing the same 'clean and rotate' with the sling shot rubber rings in the hope that will solve my breakage problem. How many single RETROFIT display kits would you need? I should be able to carve out some time later this coming week to gather a single kit or two together. Thanks Wayne. I just don't have the money right now to buy kits of five. I was hoping to buy one RETROFIT display, not a full set, to see if I could put it together and to see what it looked like in a mix with plasma displays. I also would like to order one UNO or TRADITIONAL display, not a full set, for the same reasons. I would then decide which I liked best and begin replacing the displays on all routed games later in the year when I have the money. Thanks for the offer and extra effort! Much appreciated, but I am not looking for special treatment. It wouldn't be fair to the other Pinsiders. If you don't want to break up a set, for whatever reason, that's fine. I might be willing to wait to try out a full set. New LED displays aren't a super critical problem now. I am paying about $600 a year for liability insurance only for sales $5,000 or less per year. If a machine is damaged or stolen, I have to eat it. Thanks hawknole. I just finished collecting for the month of March and there is progress. The March revenues were more than all of 2018. Of course, I was just getting started last year, but I am almost ecstatic by the progress this year. Each month is better than the last. The hard work is paying off!! I want to relate my first-time annual tax and fee renewal experiences, but that will have to wait 'til a later time. Apologies if I came across hardheaded, I was looking at tax spreadsheets yesterday for a solid 8 hours so eyes look like this..
Not a problem to work with you on getting a single RETROFIT kit and single display for one of the full kits. I'd like for you to be able to check them out, you're a good candidate to report on what you think of them matching the plasma displays and basically compare a generic style digit versus the custom digits. At the end of the year I had to pay my Tucson and Arizona state sales taxes. I also had to pay for my licenses and fees. It was a fair chunk of money, especially with my property taxes due. I'll bet you didn't know that every time you put a quarter in one of my pins, I collect sales tax? Well, I didn't know either, but that is how it works. It's called the 'Transaction Privilege Use and Severance Tax', or something like that. I call it sales tax. That amount comes off the top of your gross revenues. They don't care that I lost $2300 in 2018. This is where it gets fun. Because you collect it when the sale is made, someone puts a quarter in your game, it has to be 'backed out' of the gross revenue. After this amount is removed, you take the net revenue and multiply by each of the tax rates. This is the number you report and pay. 11.2% right off it top hurts! All fees, license costs and sales taxes paid at the end of the year - $355.60. I also added a column at the end, Capital Expenses, for tracking large cost investments. It is such a wonderful feeling having my taxes done for another year! I pulled Firepower from D&D Pinball today. It wouldn't start a game. It is acting like the 5101 NVRAM has gone bad. There were a few other small issues so I thought it best to take it home where I could give it a thorough going through. Firepower might be replaced by another classic Williams game from that era. I removed Firepower from D&D due to some issues with it. What do you replace one of the best classic Williams SS games of all time with? Why another classic Williams SS pin, of course! Thanks to Robert and Constance for allowing one of my pins to join their awesome line-up. Come on down to D&D Pinball and play some Black Knight! I removed Firepower from D&amp;D due to some issues with it. What do you replace one of the best classic Williams SS games of all time with? Why another classic Williams SS pin, of course! Thanks to Robert and Constance for allowing one of my pins to join there awesome line-up. Come on down to D&amp;D Pinball and play some Black Knight! How does your Stars do? I've got mine out in a bar alongside ten other machines and it's consistently one of the most commented on and played titles there. People love that game (self included)! March revenues were more than all of 2018. Also, I owe you a PM!!! It's been too long. In the meantime, keep up the great work in Tucson! The Stars belongs to D&D. Robert says it does pretty well because it’s newer to them, but casual players don’t tend to revere the games that we do. My Stars at my 9 game location gets played by tournament players more than casuals. Casuals will plays it, get destroyed, and move to a game with a ball save or a more familiar theme even if it costs more.